Her personal story is an inspiration to people of all ages and backgrounds across the world. Author Alicia Ash has been near death more than once, but in the end her desire to be there for her kids and her family helped her to come out a winner. In this exclusive interview she talks about her past, the transformation she has made both on the inside and outside and what she hopes her example does for others. Alicia, thank you for taking out the time to speak with us. First of all I know you are preparing for the release of your debut book. Tell our readers the name and what led you to write it. 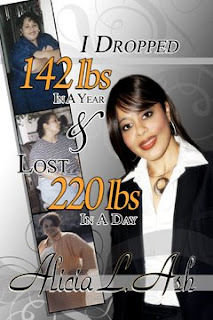 The title of the book is I Dropped 142 lbs in a year & lost 220 lbs in a Day. When I started this journey of transformation I started journaling to be able to keep track of my daily routine to see if I needed to make changes. As I began to see I was really getting great results, I wanted to share my experience with other people like myself that felt like it was not possible. As the transformation started to be so visible to others around me they were begging me to please help them so I knew then this was not about me anymore it was a ministry to bless others with a proven system that I knew works. Alot of people find it hard to look at themselves and reveal personal details about their life, but you seemed to be okay with sharing what was your truth. Was it always easy for you to do so? In the beginning it was not easy at all. You could not even get me in front of a camera let alone to be around a crowd of people, because I was ashamed at how I looked and felt. As I came to realize this was bigger than me, it was a message I wanted to share with everyone that wanted to not only shed weight but shed issues because I was carrying not only physical weight but mental weight as well. I believe we all carry too much of one or the other and we need to learn how to balance it to live healthier lives. Your journey has been anything but ordinary. In fact your unhealthy lifestyle almost killed you. What was the turning point? My turning point was once I had three strokes because of my unhealthy lifestyle. The third one did it for me. Then there was knowing that I could possibly not be here for my children. To leave behind for them to know how to be healthy and teach them how to live a better life is the best gift I could ever give them. Weight-loss is only part of your story. How much would you say you have changed emotionally and spiritually as your body changed? I have grown so much. Some may say it is a bad thing to get a divorce, and at first I thought that too but to stay in it I would have been pleasing people. I was married 15 years and in order for me to grow he and I both knew we had to be apart to be happy. We are much better as friends than we were in a marriage, and we are better parents and not living in a marriage that was not growing spiritually or emotionally. I always say evaluate your situation and make changes from there. 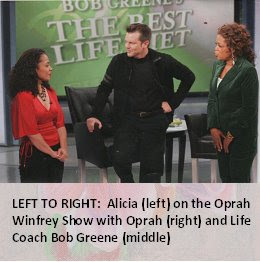 In 2006 you achieved what is the goal of so many people: being on The Oprah Winfrey Show. What was that experience like for you, and how much did it encourage you to your commitment to stay healthy? Wow, being on the show and meeting Ms Oprah was the second best goal to accomplish. When I walked on that stage I was like I can do anything I put my heart and soul to because I do know there are celebrities that have not been on her show. I was just amazed and very thankful for the oppurtunity. She is my American Idol and that alone keeps me motivated. I promised myself if I accomplished this major task I would not go back to living minor in my mind. I'm curious, Alicia, what do you hope people get from hearing and reading your story? I hope my message will encourage people to live happier, healthier lives. Do research ,get checkups know your body and don't let it be too late to want to make a change. Do it now and pass it on to your children. Obesity is nothing to play with. It causes so many other health problems that can be prevented, so hopefully by me having another chance at life people will see it can be done and it's not about a number on the scale or a size 2 clothes: It's about being healthy and feeling good on the inside and that will flow out. What advice would you give for someone who has a family member or friend that is battling the demons that you faced? To encourage them and be a support team for them in a good way, not being negative. Make small changes like I did instead of celebrating all with food do something different. Aside from your book, what other projects are you involved in? I am excited to be a guest judge on the upcoming reality show Write Stuff that will be debuting in the summer of 2009. It is such a great opportunity for aspiring writers to see what is involved in the process and to network with those who are making their mark in the end. Though there can only be one winner, all the contestants will glean so much from the experience. I also have a foundation called SKIN DEEP. You can go to my web site and get more info www.aliciaash.com, and in the I future I am hoping to launch a clothing line. On top of that I travel the country as a motivational speaker. When it comes to writing, if someone feels as though they have a story to share, what would you tell them to do? I would say get as much of your material in the proper format, do plenty of reseach on how to become an author because there are plenty of people that have a great story but are not writters. Get to the right people and never give up on your dream because only you can make it become a reality. Thank you for your time. How can our readers find out more about you and your upcoming events?